On-line ticket reservation and timetables for Naples to Sorrento hydrofoil crossing. Guide includes prices and journey times as well as other useful information about options for travel between Sorrento and Naples. With a journey time of just 45 minutes, the hydrofoil crossing from Naples is one of the most efficient ways to get to Sorrento. From the airport to Naples Beverello Port takes around 20-25 minutes by either taxi or the Alibus which also stops at the Stazione Centrale in Naples city centre. 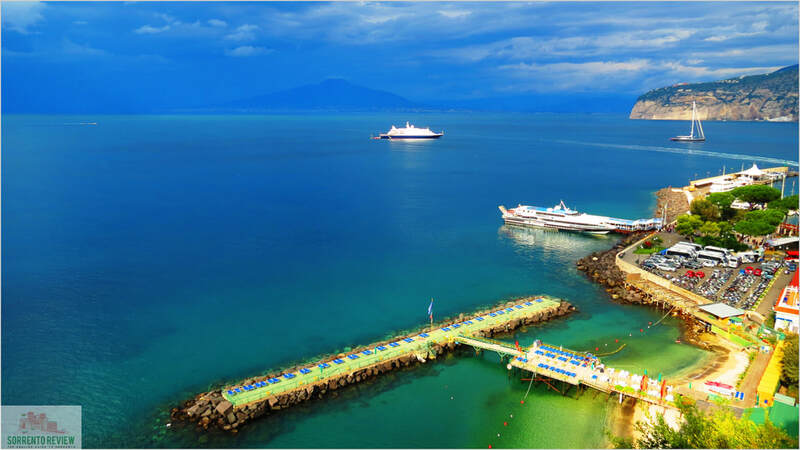 Other options include the Circumvesuviana train line (which we explain about in more detail on our Amalfi Coast Travel Guide and Ferry Booking page) and the bus from Naples Airport to Sorrento via Castellmare di Stabia which takes an hour and 15 minutes. A further option is to take a private transfer from Naples Airport to Sorrento which is done by taxi. If you're interested to know more about the service and the prices please drop us a line at info@ischiareview.com. For those of you that wish to take the hydrofoil from Naples to Sorrento please use our booking engine below which includes crossings provided by Alilauro and SNAV. With the booking engine you can check on sailing times for any given day of the year and also make a booking online if required. Please note that the ticket booking service is provided by our partner company "Traghettilines/OK-Ferry" who issue the tickets and deal with any booking-related queries. An online booking fee is applied to all reservations made with this system but these charges can be avoided if purchasing directly from the relevant ticket office on the day of travel.